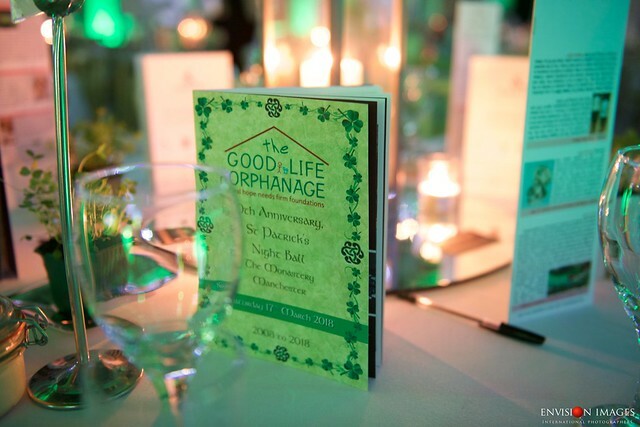 It was wonderful to welcome our family, friends and fantastic supporters to our St Patrick’s Day Ball celebrating 10 years since we opened the doors of The Good Life Orphanage. Over 100 children have come through our gates, some have been adopted, some have been reunited with their extended families, sadly we have lost two children and 64 children are with us today enjoying “The Good Life”. 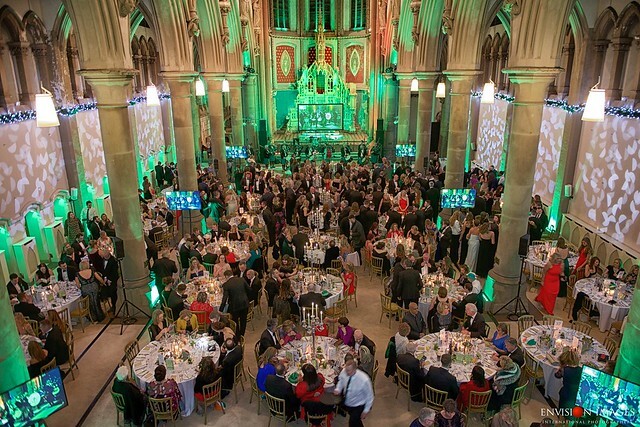 There have been tears & tribulations but thankfully we have had fantastic support since Day 1 and it was only fitting that we should celebrate it in the stunning setting of The Monastery, Manchester. 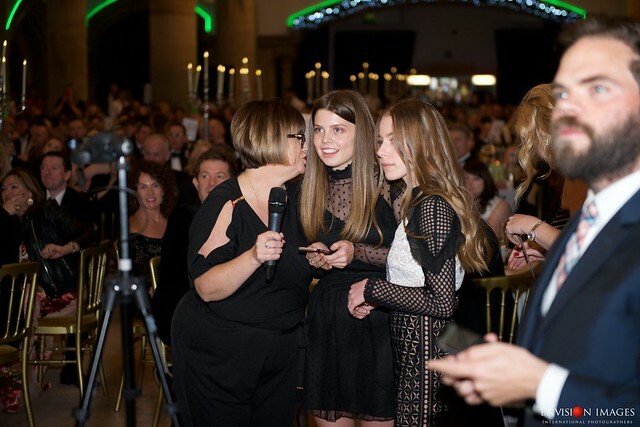 We have the most amazing, dedicated fundraising committee here in Manchester, Anne-Marie, Catherine & Karen give up their time to ensure the night was a big success and now with the next generation of Roisin, Grace & Mary-Anne onboard it makes a very formidable team at the helm. 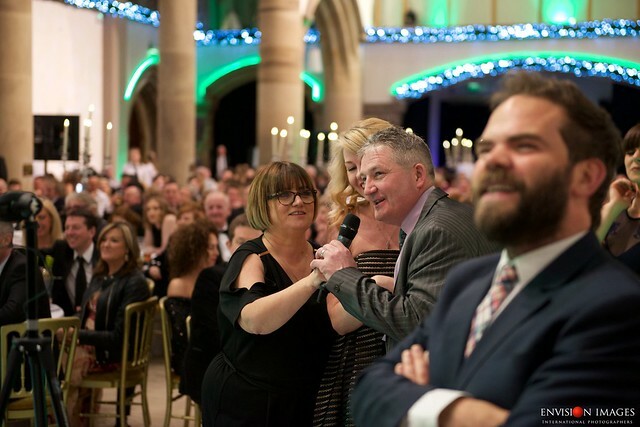 The precision planning was faultless, with over 400 people attending it was like a military operation, organising tables, entertainment, auctions and prizes for the night was no mean feat, the result was a spectacle for everyone to enjoy. Joe Casserley our MC for the night was on-hand from early in the day and being lead through the Cloisters into the Great Nave of the Monastery by The Fianna Phadraig Pipe Band, who are actually celebrating their 70th Anniversary this year, was the perfect start to St Patrick Night festivities. Father Paul Cannon’s “Grace” was very moving as he has visited The GLO & SBM School in 2012. 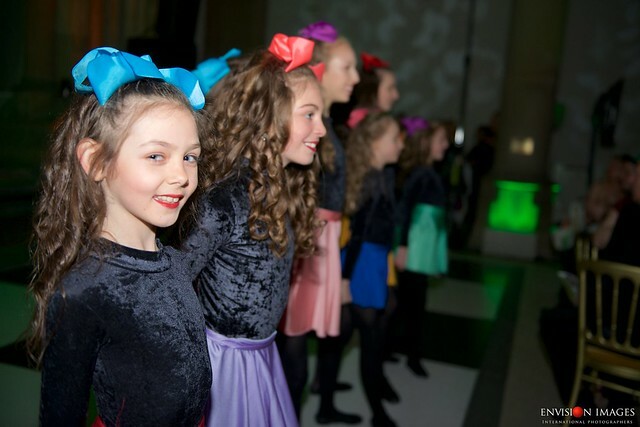 We were delighted to welcome Grace Kennedy School of Dance, these young dancers are a sight to behold and under the tutelage of Grace are brilliant Irish Dancers. 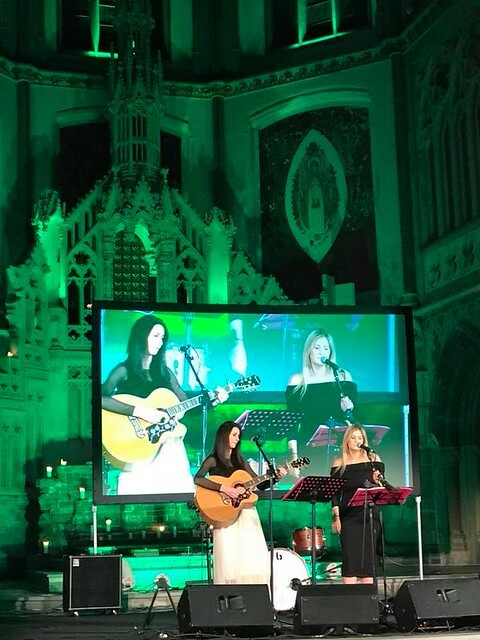 Whilst The Monastery Staff were busy serving the scrumptious food The O’Sullivan Sisters entertained the crowd with their beautiful harmonies, and our very keen helpers gathered up the envelopes for the “Name on the Note” draw and sold tickets for our Grand Raffle. The “Name on the Note” prize was a weekend stay at the amazing Kilronan Castle Estate & Spa donated by Tim & Karen Kilroe, the Grand Raffle 1st Prize was also an unbelievable two night stay at The Ballyliffen Lodge & Spa kindly donated by Sean & Mary Keogh, everyone was hoping they were the lucky ones as prizes of this calibre are very sought after. 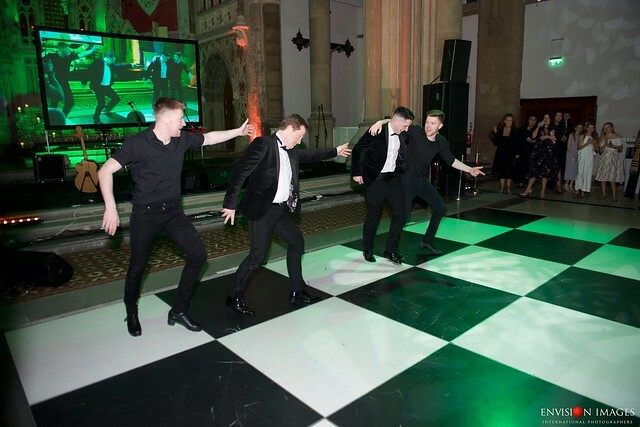 The magnificent Hester Twins had all the ladies especially enthralled for the next twenty minute with their own take on traditional Irish Dancing, they even persuaded some other to join them on the floor including Tom Howley who showed his own dancing skills. Roisin’s dedication over the last ten years has not faltered and again this year she complied an audio-visual presentation of the trails & tribulations leaving not a dry eye in the house. Thanks to Caitriona for contacting and organising the special message from Daniel O’Donnell which everyone really appreciated. The atmosphere in The Monastery was electric but no-one apart from the chosen few knew what was happening next, thanks to Sterling Event Group & Kevin Junior for managing to co-ordinate a live link to The Good Life Orphanage, although there was three hours in time difference we all sighed a sigh of relief when we saw Kevin with all the staff, children and even Father Gabriel appear on the screen. The preparations on the other side of the equator had been pretty intense as Kevin struggled with the poor internet connection and there were a few choice words said over the days leading up to the 17th March but it was alright on the night. 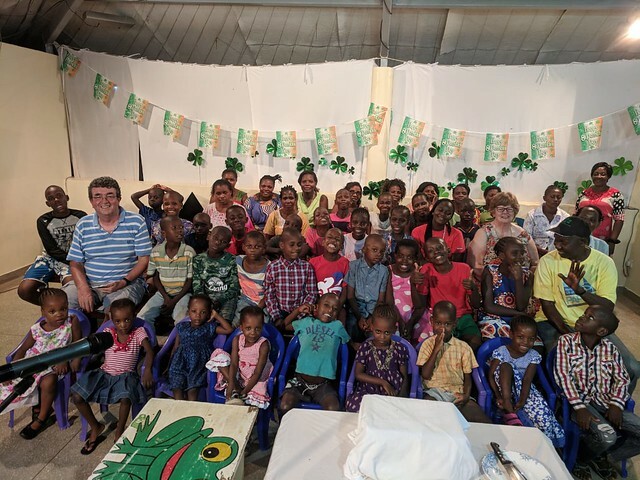 Our GLO House Mamas, Aunties and children all looked very smart, we had brought some St Patrick’s Day paraphernalia out on our last trip so many had hats and shamrock hairbands on whilst all had their faces painted green, white & gold. 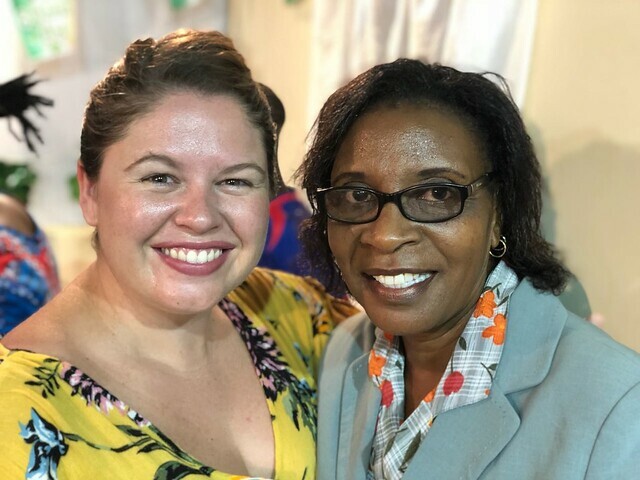 It was wonderful to have Beth and her family travel down to Mombasa for the weekend to ensure all went to plan. 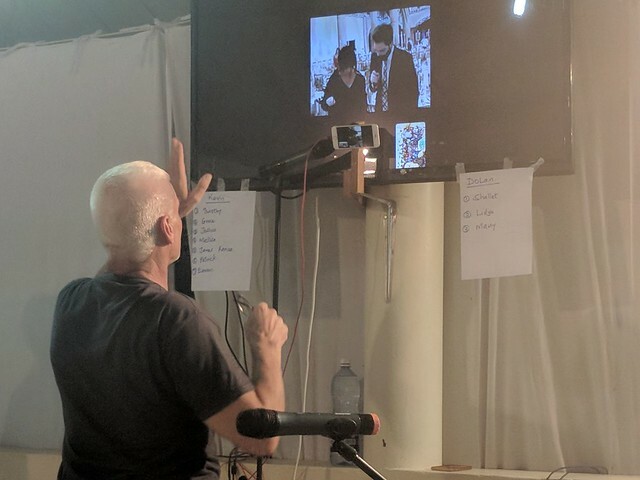 Kevin could now relax as all went really well and we had a perfect connection with none of the usual “freeze frames” when doing a video call between the U.K. & Kenya. 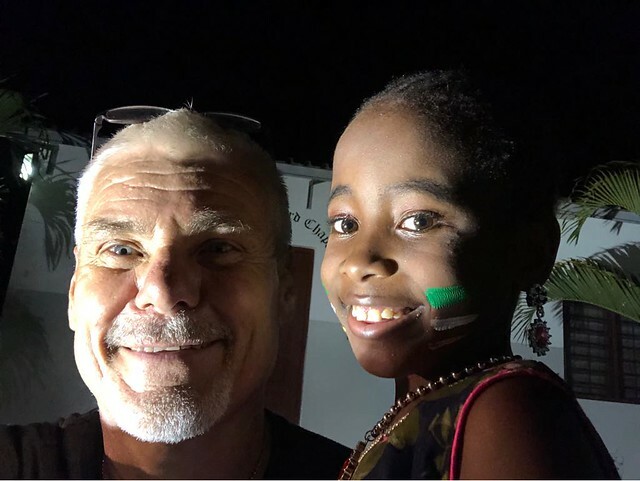 Many sponsors of our GLO children were in the audience but due to time constraints and some of the children being very shy it was decided that Caleb & Constance would speak to their sponsors. Lucia & Aine asked a very dapper Caleb some questions followed by a very moving chat between Jackie & Dermot and our little Constance. Jackie & Dermot were at The GLO on the day Constance arrived and met her mother who sadly passed away two days later from HIV Aids so there is a very special bond there. Now that Caleb has seen Lucia & Aine he is very keen that Des, Nina & family come to visit him as well. 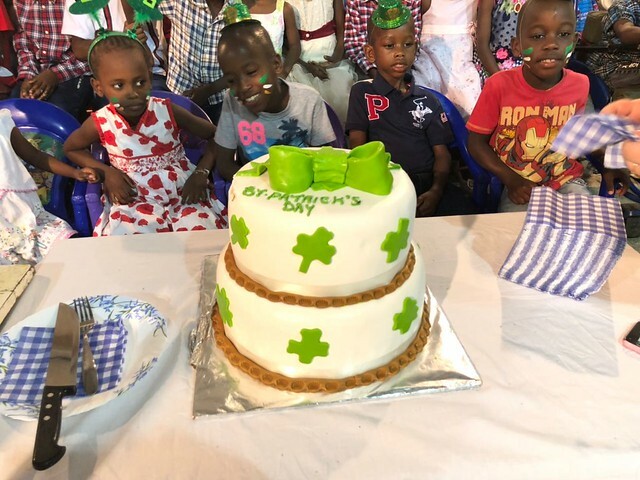 After seeing the children cut their impressive St Patrick’s Night cake, we said goodbye and went straight into our auction, again we were blown away by the brilliant prizes donated and the very generous people who bid on the prizes. With the help our our experienced spotters, Joe really worked so hard and made it a big success raising in excess of £22k. 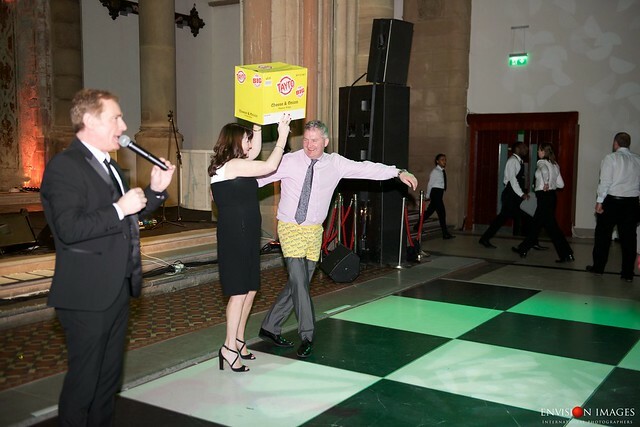 The silent auction run by Auction Direct also was a big hit with our very generous supporters on the night. 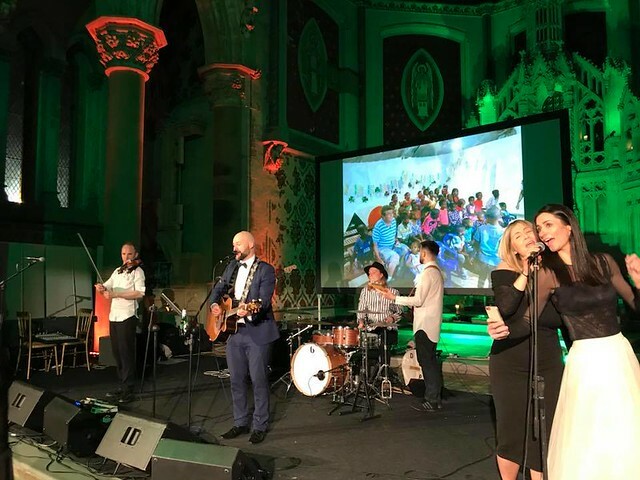 With the first song from the fantastic Commotion Band the crowd hit the dance floor and it never emptied until 2am in the morning, the O’Sullivan Sisters joined them onstage and The Monastery was indeed rocking. 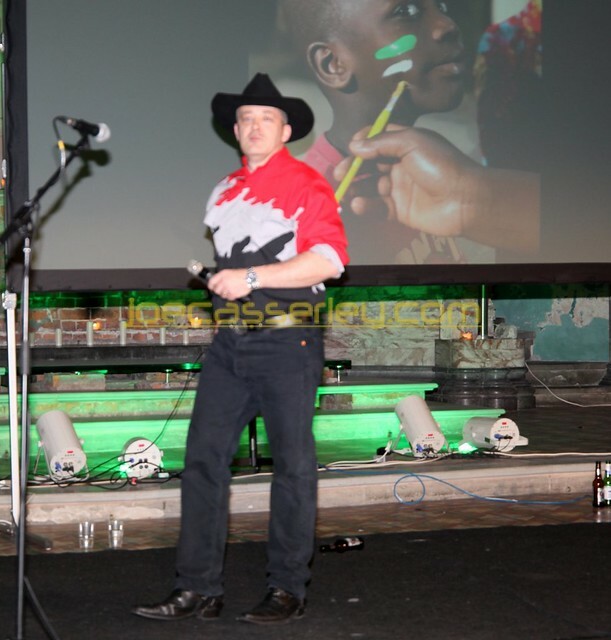 Our very dear GLO friend Scott Welsby rushed all the way from Stoke-on-Trent in treacherous driving conditions to finish off the night with his Blame it all on my Roots Ultimate Garth Brooks Experience and as what is a tradition at our GLO Charity Ball was joined onstage by the irreplaceable Eamon O’Malley. We have many people to thank including Bernie & Martin White, Mike Flynn & UDP Ltd, Eamon & Anne-Marie O’Malley, Henry Holland, Stockton Furniture, Kevin McNeill and U.K. & Ireland, Bethan Lewis & Kevin Maguire Jnr, John & Charmaine Murphy, Peter & Denise McKenna, Kate Harrington, Tom & Mary Howley, Joe & Mairead McErlean and Liam & Mary McKenna for donating our auction prizes. 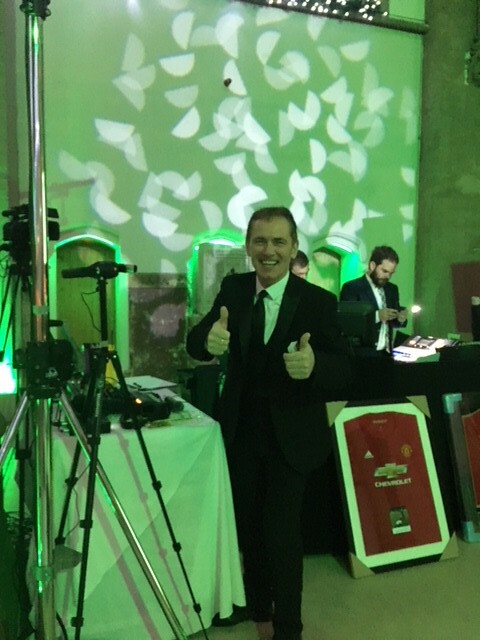 We would also like to thank the people who bid successfully on the auction prizes, you all know who you are and as always your generosity is astonishing. 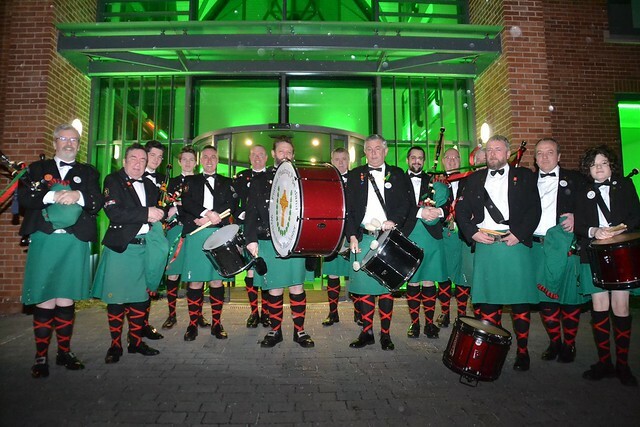 Joe Casserley, Father Paul Cannon, The Fianna Phadraig Pipe Band, Grace Kennedy School of Dance, O’Sullivan Sisters, The Hester Twins, Richard Sanderson & The Commotion Band, Scott Welsby, you all made the night unforgettable. 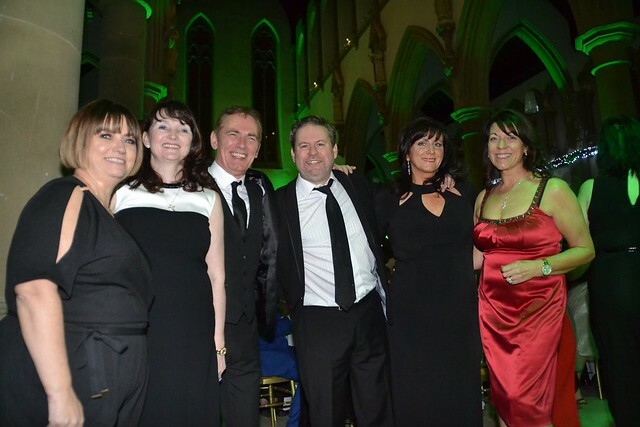 Thanks to Tony Hennigan for all the publicity, wonderful photos on the night and promoting of our charity during Manchester Irish Festival 2018, Vincent Connaughton for donating the brochures on the night, Dave Richardson & Mark Copeland for giving your time free of charge and capturing the atmosphere to a tee, Sterling Event Group and The Monastery Manchester. 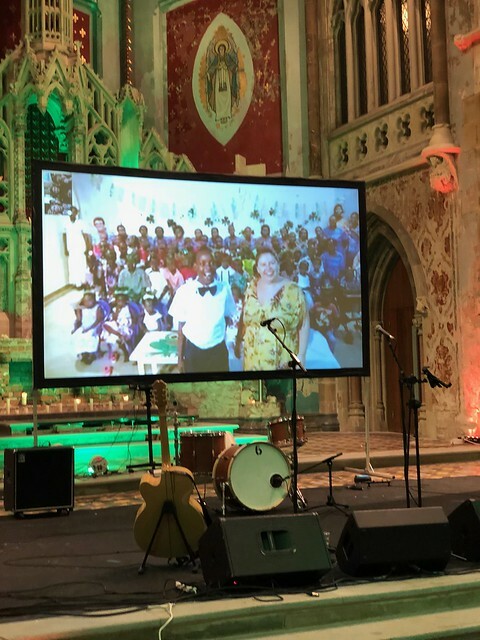 Last buy by no means least a massive Asante Sana to our dedicated & selfless GLO fundraising committee based here in Manchester (you are amazing), to organise an immense function raising over £50K for our charity is just mind-blowing. 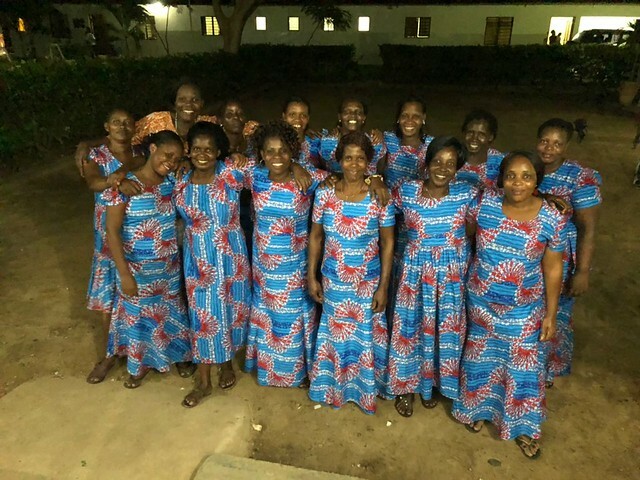 We are truly blessed to have such wonderful friends and such generous supporters who have been with us on this journey for the past ten years, you all have made The GLO what it is today and for that we are so grateful. I will like to donate some money to your orphanage today . Please send me your full address and phone number asap.